Quad Fighter with Mimix Controller | QFO Labs, Inc.
Posted January 14th, 2014 by admin & filed under . Command the sky or at least the air above your cubicle. 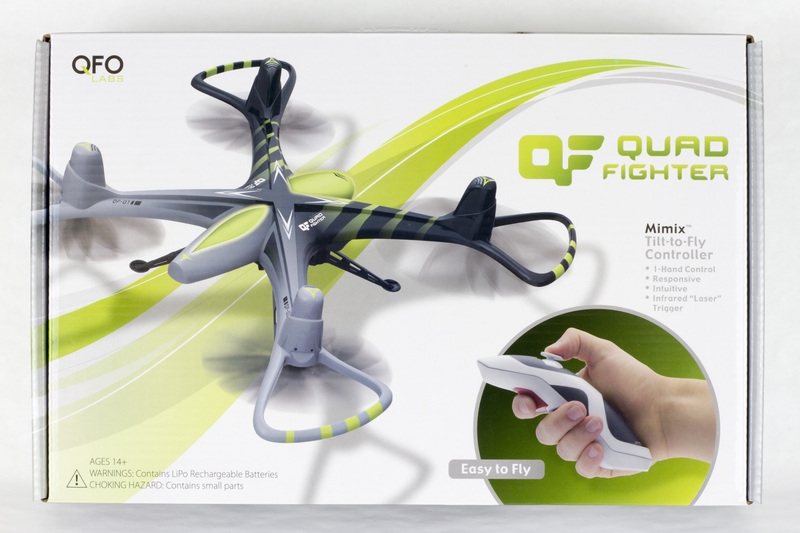 The Quad Fighter is controlled by the patented Mimix control system. We set out to create a unique flight experience, one that is easy enough that you don’t get discouraged but challenging enough that you will want to master. We feel that we have done just that with the intuitive Mimix control system. 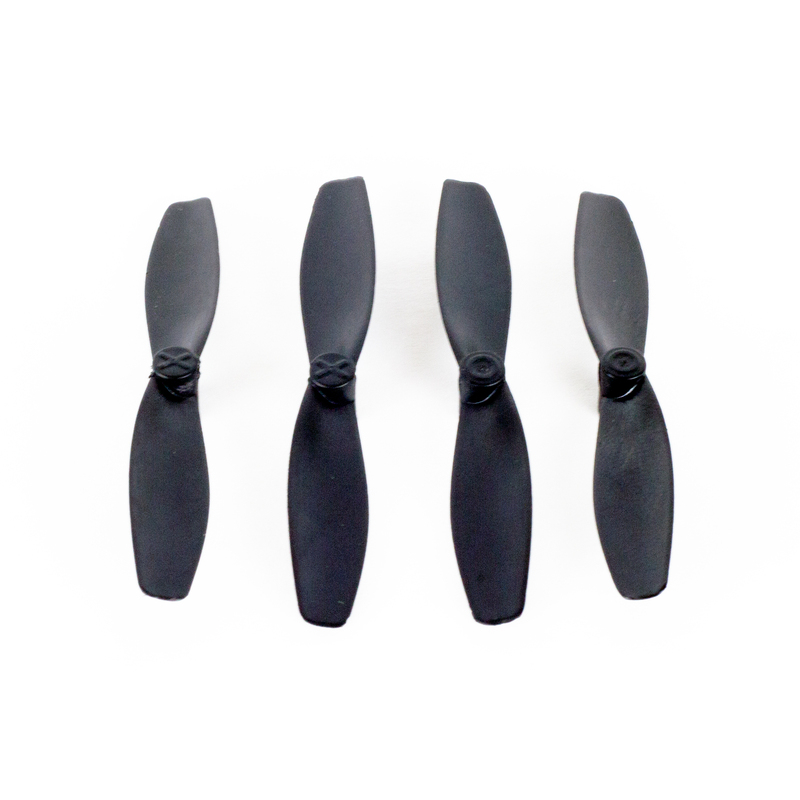 After a few flights you will be commanding the Quad Fighter to do your bidding with a simple tilt of your wrist. But don’t worry about getting bored. We have built in a dog fighting game that will allow you to do battle with as many Quad Fighters as you can fit in the air. You and your friends will be challenged to shoot’em down with the completely safe on board IR “Laser”. The first hit will cause your victim to wobble in the air and flash your team color. Their Mimix controller will also flash your team color and make a satisfying explosion sound recording the hit. On the second hit your opponent’s Quad Fighter will wobble and flash again. On the third hit their Quad fighter will be forced to land for 10 seconds before they can get back in the game. Command the sky! Challenge your skills! Compete with your friends! This is real 3D aerial gaming! 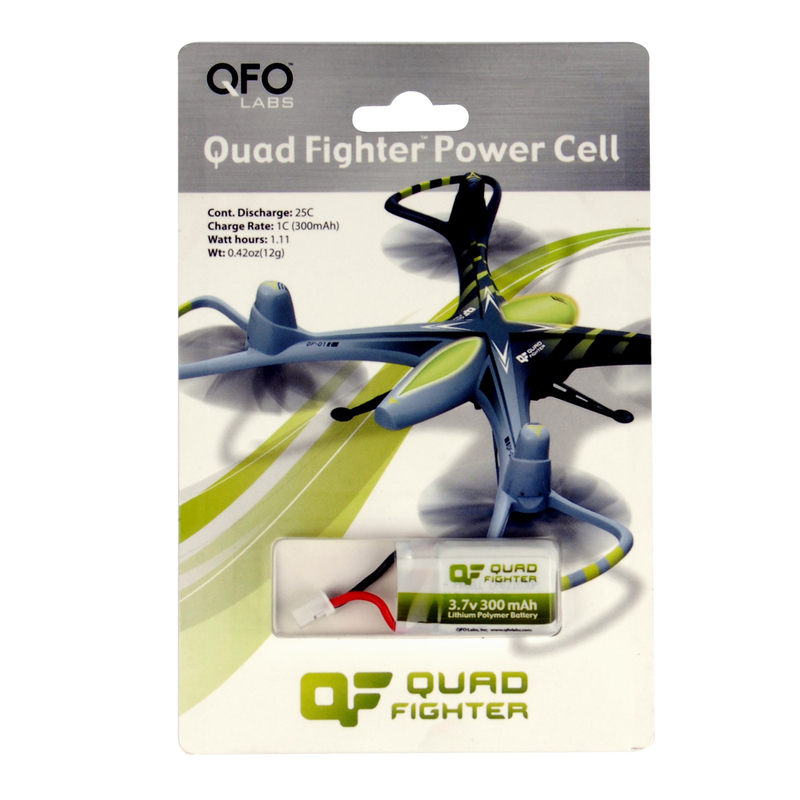 The Quad Fighter with Mimix controller includes: 1 – Quad Fighter quad rotor helicopter, 1 – patented Mimix Controller, 1 – Power Cell battery, 1 – USB powered Quad Fighter battery charger, 1 – USB charging cable, 1 – extra set of four propellers, 1 – Quick Start guide, 1 – Owners manual all in a convenient box that can double as a protective carrying case. No extra batteries are required. Both the Mimix controller and the Quad Fighter use rechargeable Lithium Polymer batteries that can be recharged from any USB power source, like a cell phone charger or a USB computer port. Both the Mimix controller and the Quad Fighter battery charger can be used with any micro USB cable.